Japan Water Forum held a session in Myanmar Water 2016, Yangon, Myanmar. Myanmar Water 2016 is the Myanmar's first dedicated water show. 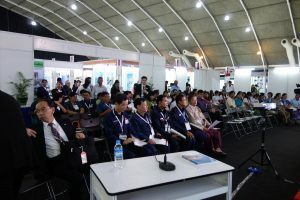 The 4th edition of Myanmar Water 2016 is back with more key industry players in Water and Wastewater management and sanitation from all over the world. More that 100 corporations, institutions and organizations joined in the event. The session introduced Japan’s bitter experiences during the period of rapid economic growth from 1954 to 1973, as well as the counter-measurements and technologies adopted to overcome their problems. Through the session, participants had an opportunity to discuss the sustainable development of Myanmar from the viewpoint of water-related problems as well as the contribution by Japan. During the session, the importance of preliminary measures to minimize water-related damage in the rapid urbanization was recognized. Towards the sustainable development of Myanmar, further contributions by sharing knowledge and experience from Japan are highly expected. We extend our gratitude to the organizer of Myanmar Water 2016, presenters, participants and those who concerned.